Make sure the handset is on a flat, stable surface. 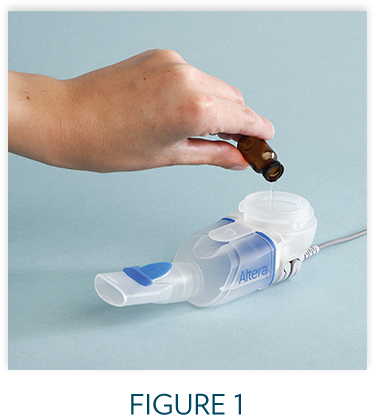 Remove the rubber stopper from the vial, then pour all the mixed CAYSTON and saline into the Medication Reservoir	of the handset (Figure 1). Be sure to completely empty the vial, gently tapping the vial against the side of the Medication Reservoir if necessary. Close the Medication Reservoir (Figure 2). Begin your treatment by sitting in a relaxed, upright position. Hold the handset level, and place the Mouthpiece in	your mouth. Close your lips around the Mouthpiece (Figure 3). 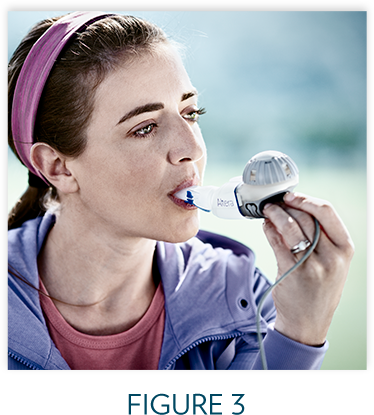 Breathe in and out normally (inhale and exhale) through the Mouthpiece. Avoid breathing through your nose. Continue to inhale and exhale comfortably until the treatment is finished. 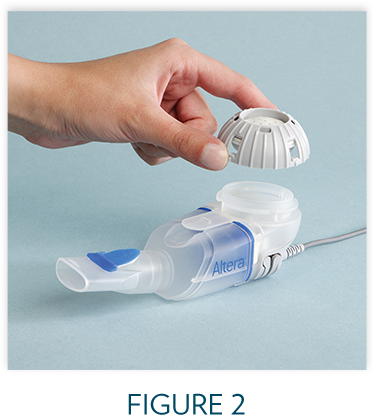 The empty vial, stopper, and saline ampule should be disposed of in household garbage upon completion of dosing.